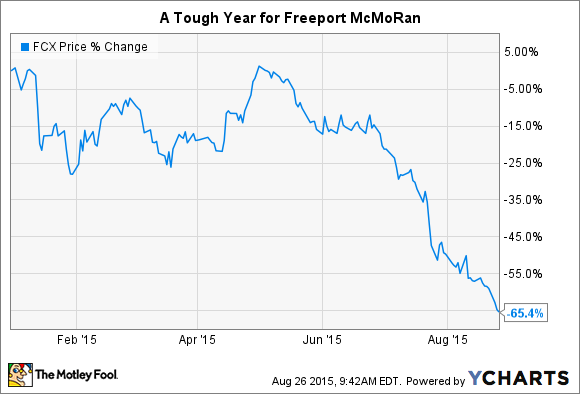 Is Freeport McMoRan Destroying Shareholder Value or Preserving it? The issuing of stock comes at what looks like a horrible time. In late July, Freeport McMoRan (NYSE:FCX) reported a second-quarter loss of $1.78 per share. Although that performance was driven by large writedowns in the value of some of its assets, it just goes to show how bad the miner's core markets are right now. In fact, the stock is down roughly 65% this year alone. So why on Earth is Freeport planning to issue up to $1 billion worth of shares? 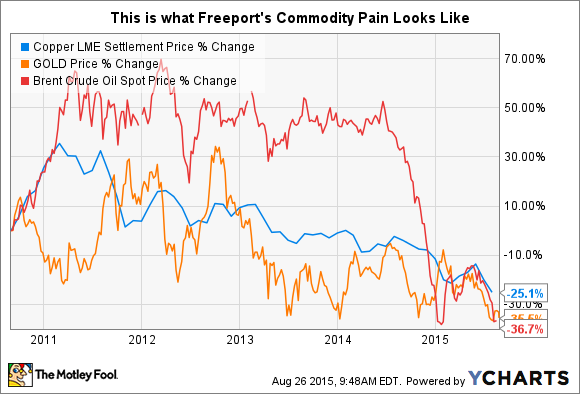 Like similar miners, Freeport has had a rough go of it since 2011, when most commodity prices peaked. To add insult to injury, its ill-timed shift into oil drilling in 2013 turned into a major headache shortly after a big acquisition because oil prices have been on the decline for close to a year. In other words, there isn't much going right for the company. Earnings tell the story in gruesome detail. In 2011, Freeport made nearly $4.80 a share; last year it lost roughly $1.25 a share. Now, the red ink through the first six months of this year was $4.16 a share. These are tough times, a fact that helps explain the steep drop in the company's stock price. That's why it should be somewhat confusing to read that Freeport is looking to sell up to $1 billion worth of stock. At recent prices, that would mean over 120 million new shares, a roughly 12% increase in the share count. Since the goal of the equity issuance is to pay down debt, not to invest in growth initiatives, the new equity will simply dilute the earnings attributable to each share. That's not the type of thing an investor likes to see. Of course right now the new shares will have a counterintuitive impact, since a loss spread over more shares means a smaller loss per share. But longer term, the impact will be lower earnings. So on the surface, Freeport McMoRan is hurting shareholders by issuing a large number of new shares at what is clearly an inopportune time. But is it as bad as all that? Well, yes, it is. However, Freeport might be doing the right thing anyway. Since the company's bottom line is so weak, Freeport is struggling to make ends meet. Like all other commodity players, it's been cutting costs as fast as it can. But so far nothing has stopped the carnage. And one of the biggest overhangs is the roughly $20 billion of debt sitting on the company's balance sheet. That debt, by the way, came about because of that aforementioned oil acquisition. It started 2013 with $3.5 billion in long-term debt and ended it with $20 billion. Through the first half of the year, interest expense was roughly $300 million, a tough nut to crack when every market you're in is in the dumps. That situation brings into stark relief the concern about, well, staying afloat. Not that Freeport is on the verge of bankruptcy, but it has to do something to make sure its debt doesn't turn into a much bigger issue than it already is. And with weak commodity markets, the best answer is for Freeport to sell shares and use the cash raised to pay down its loans. If you read that and said to yourself that it sounds like Freeport is desperate, you probably wouldn't be too far off the mark. Conservative investors should thus probably avoid Freeport until it gets its financial house in order. This single equity raise won't be enough to achieve that goal. Still, the shares will probably put Freeport on more sound financial footing, which might interest more aggressive investors looking for a contrarian turnaround play. But until commodity prices turn higher, expect Freeport to keep struggling.